There are various types of coffee grinders, ranging from the simple blade grinder to highly advanced burr grinders. While you could use any grinder for drip coffee, making a speciality coffee like espresso or Turkish coffee requires fine coffee grinds, and thus a coffee grinder capable or producing such grinds. These is part five of the Ultimate Guide for Grinding Coffee Beans, a comprehensive guide in which you'll learn anything needed to making the perfect coffee. In this article we will the various types of grinders available. 2. What are the best coffee beans? 3. What is the most expensive coffee? 4. How to store coffee beans? 5. What are the different types of coffee grinder? 6. What is the best coffee bean grinder? 7. What are the most delicious types of coffee? 8. How to grind coffee beans? 5.0 What are the Different Types of Coffee Grinders? Blade grinders: This variety of grinders is typically powered by an electric motor. As the name suggests, blade grinders use sharp rotating blades to dice coffee beans within the grinds chamber. Burr grinders: These grinders are also typically powered by an electric motor, but use a different grinding mechanism. Burrs, serrated gear-like discs, rotate against each other while beans pass in between them, crushing them more uniformly and consistently. Manual grinders: Manual grinders also mainly use a burr grinding mechanism, but are not powered electrically. Instead, their burrs are rotated manually, usually by hand cranking a handle on the device. Generally speaking, burr grinders are the most oft recommended devices for specialty coffee drinkers, and we will discuss them in greater length below. Specialty coffee drinkers typically avoid blade grinders, for reasons we will discuss below. Now that you have an understanding of the basic differences between different types of coffee grinders, it is time to delve a little deeper into each category. In this list you will find both the best electric and manual burr coffee grinders. Even when you decided to go for a burr grinder, there's still a lot to choose from. If you don't mind a bit of hand cranking, you will find a great selection of manual grinders. Blade grinders are the cheapest, most widely available variety of coffee grinders. They resemble miniature blenders in aesthetics, and function in almost the exact same way. Depressing a firing switch on the machine causes the motor to power up, which in turn rotates the blades at a very high RPM. The contents of the grinds bowl are pulverized in a matter of seconds, at which point the switch can be disengaged. Their price and simplicity make them appealing to specialty coffee novices, but they should be avoided by anyone looking to brew a great cup of coffee. There are many disadvantages to buying this type of grinder. First and foremost, blade grinders operate at a very high RPM. The incredible speed of the blades creates a lot of friction, which translates to heat. As explained in the coffee storage section of the guide, heat causes oxidation, which degrades the flavor and aroma of your coffee. While this can be mitigated somewhat by pulsing the blades in short bursts, you will still be causing an unnecessary amount of oxidation on your coffee. Secondly, blade grinders are notoriously poor at achieving uniform grinds. There is no mechanism to separate grinds once they reach an ideal coarseness. Also, the blades are only in contact with a small portion of the bowl contents at any given time, you are bound to get fines and chunks mixed together. Lastly, it is very hard to modulate grind coarseness on blade grinders. Even blade grinders that have coarseness presets in the form of a timer are significantly less precise than the cheapest burr grinder. Even as a novice, you’ll see a clear difference between the results produced by a blade grinder and burr grinder. Burr coffee grinders are superior in nearly every respect. But exactly what is a burr grinder? As mentioned in the short description provided above, burr grinders are electronic mills that use burrs to crush coffee beans. They are largest class of coffee grinders, the most feature packed, and also the most expensive, relatively speaking. Without delving too deep into the mechanics of each device, there are three major user-end differences between blade grinders and burr grinders. While blade grinders keep your beans in the same bowl they will be ground in, a burr grinder has a separate bean storage space. Called a “hopper,” it is an airtight, non-porous funnel-shaped container that stores your coffee beans in between grinding sessions. Even the cheapest burr grinder varieties have this feature. 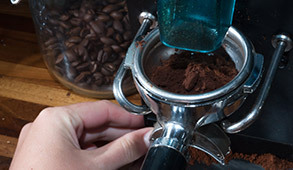 Unlike a blade grinder, a burr grinder will typically transport ground beans through an internal chute, depositing them into a plastic or glass container at the end. For more specialized burr grinders, like espresso grinders, the container is usually replaced with a portafilter holder, allowing you to grind directly into your espresso portafilter. While some brands of blade grinders claim to have adjustable coarseness settings, this is a deceptive marketing description of a timer feature, not any actual adjustment. Burr grinders have true coarseness adjustment, as the grinding mechanism itself can be changed to accommodate for different particle sizes. This is achieved by modulating the size between the grinder’s two burrs—the closer the burrs are, the finer the ensuing grind. With this basic understanding, you can answer the question “what is a burr grinder?”. If you are interested in a more detailed description of the mechanics of burr grinders, we will examine them in the next section. Found concealed at the hearts burr grinders and manual grinders, burrs are a grind mechanism distinct from blades. Regardless of shape, size, or material, burr sets always come in two pieces. Each of these pieces is a gear-like component with sharp, spiraling raised edges. When the burrs rotate, their larger outer edges catch coffee beans and direct them towards the smaller, sharper edges in the center. Adjusting the distance between the two burr pieces allows you to modulate grind coarseness. When the burrs are closer together, bean particulates are forced deeper into the burr mechanism, where the smaller edges will break them down even further. While the mechanics for most burr varieties are nearly identical, there are three main distinctions that impact the overall performance of burrs (beyond, of course, manufacturing quality). The first major distinction between burr types is material; some are made from stainless steel, while others from ceramic. Stainless steel burrs are more rugged, better suited for coarse grinds, typically cheaper, but tend to become dull quicker than ceramic. Ceramic burrs are more precise, better suited for finer grinds, have a better overall longevity, but are fragile enough to shatter if dropped or mishandled. The next distinction in burr types is size; some are as small as 40 mm, with others almost twice the size at 75 mm. Small burrs, which are most often found on consumer-grade grinders, require a higher RPM to achieve reasonable grind times, and are typically designed for much smaller grind volumes. Large burrs, typically found on more industrial machines, can operate on a much lower RPM due to the increase in surface area, and are meant to handle a café level volume of production. The last important distinction between burrs is shape; flat burrs resemble discs with inward facing sharp teeth, and conical burrs are composed of one cylindrical burr and an inside cone shaped burr. Flat wheel burrs are typically the cheaper variety, and are known for being louder, messier, and less consistent than their conical counterpart. Depending on the beans used, flat burrs may require recalibration in between grind sessions. Conical burrs are larger, more expensive, but ultimately superior. They provide a more even and consistent grind, require a lower RPM, cause less of a mess, and are notably quieter than flat burrs. Their main advantage lies in consistency, and settings seldom need to be changed to achieve the same grind coarseness over several sessions. In the ideal scenario, the best burr grinder would use perfectly machined large ceramic conical burrs and a low RPM motor. However, given the wide discrepancy in precision and build quality from manufacturer to manufacturer, there are plenty of examples of small steel flat burrs outperforming the former. In fact, if you look at our list of Top-10 Burr Grinders, you’ll find that some of the top examples don’t use the theoretical ideal, and still manage to outperform many grinders that do.These discrepancies can be in part accounted by different grinder ranges and purpose-specific grinders, which we will examine in the next section. Entry-Level: These burr grinders are typically priced below $100, and offer just enough variability and uniformity to grind for the most basic brewing methods like auto-drip and pour-over. If you do not wish to expand beyond these brewing methods, an entry-level may be exactly what you need. Examples of great entry-level burr grinders can be found from Bodum, Mr. Cof﻿﻿fee, Capresso, and DeLonghi. Mid-Range: Pricing between $100 and $250, mid-range burr grinders offer more variability, better uniformity, and higher build quality. These grinders are better suited for grinds like French press, and can sometimes even have enough adjustment settings for a decent shot of espresso. Examples of great mid-range grinders can be found from Breville and Baratza. High-end: These grinders are the best of the best in the home-grinding category. They offer the most variability, the best uniformity, and the most features. High-end consumer grinders are typically all-purpose, meaning that they can grind for any brewing method, from French press to espresso. They are also typically very feature-packed, offering things like LCD displays, programmability, and precision dosing features. The best high-end grinders come from Breville, Baratza, Rancilio and Mazzer. Purpose Specific: A good example of this category is an espresso grinder. This type of burr grinder is qualitatively comparable to high-end or commercial grinders in performance but is fine-tuned for a specific application. In the case of an espresso grinder, the adjustment range is limited to the finest settings and grinds containers are replaced with portafilter holders. The most notable purpose specific grinders come from Baratza and Mazzer. Commercial: These grinders are designed to produce the highest volume of grinds, as many times as possible, for as long as possible, a feature necessary for a fast-paced café environment. Because of this, commercial grinders have much sturdier builds, larger burrs, and more powerful motors. For drip brewing in a café, commercial grinders provide the fastest and most consistent grind possible. For purpose-specific applications, like espresso, commercial grinders are designed for the convenience of a barista, with features like dosers. Two prominent manufacturers of commercial grinders are Bunn and Mahlkonig for all-purpose grinding, and Mazzer for espresso grinding. Baratza offers a full range of coffee grinders, from entry-level for commercial grade coffee grinders. Rancilio offers high-quality and excellent performing coffee grinders at very competitive prices. If you are looking for the best espresso coffee grinder, Mazzer has exactly what you need (even though it's a bit pricey). Despite the recent modernization of manual coffee mill designs, manual grinders have actually been around for hundreds of years. In fact, the burr mechanism design owes its existence to manual grinders from the 18th century and has remained largely unchanged since its inception. If you can answer the question “what is a burr grinder?” confidently, you already have a very solid foundation for understanding how manual grinders function. In short, manual grinders use the same grinding mechanics found on burr grinders, but without an electric motor powering the process. The same burr materials and shapes are present on manual grinders, albeit smaller. As a general observation, manual coffee grinder reviews indicate that these machines are the most reliable and consistent method of getting a fantastic grind. Our own tests confirm what has been said in manual coffee grinder reviews. There are, however, several caveats to using a manual coffee grinder. Firstly, a hand crank coffee grinder can be tedious and slow, providing quite a forearm workout every time you need to brew some coffee. Secondly, a hand coffee grinder typically features a very small hopper and grinds container, meaning that you can only churn out enough grinds for a few cups of coffee before having to refill it. Finally, many of these grinders suffer from wobbling burrs, especially on coarser settings. Because hand cranking introduces a range of motion to the burrs beyond rotation, they may seesaw back and forth, producing a less uniform grind. Despite these nearly universal issues, a hand crank coffee grinder will still perform better than even the priciest mid-range and high-end electric burr grinders. If you are not turned off by a bit of a morning workout preceding your coffee, there are several manual coffee grinder variations that you should explore. In the 300 years that hand crank coffee grinders have been used, several distinct designs have emerged. Although they operate on the same principles, aesthetics and ergonomics vary widely. This type of grinder is the simplest and most streamlined in terms of design. It is usually more ergonomic than other varieties, with a shape that is easily gripped in your hands. Their enclosures are typically made from glass or plastic, and their burrs from ceramic. Hario and Kyocera manufacture some of the best modern hand mills. Most often replicas, although sometimes original, antique coffee grinders are distinguished by their use of older designs. Any manual grinder using a design from the 1800s to the 1950s can be considered an antique coffee grinder. While aesthetics range greatly between time periods, an antique coffee grinder is typically made of wood and die-cast iron, with stainless steel burrs. While Hario and Melitta manufacture antique coffee grinder inspired replicas, the best examples come from Zassenhaus. The most unusual manual grinder design, and also the most rare, belongs to the Turkish coffee grinder. A Turkish coffee grinder is usually encased in a metallic cylinder (brass), decorated with intricate ornamental etchings. Although such designs can be considered antique, the purpose-specific nature of this grinder justifies its own category. Turkish coffee grinders use flat steel burrs to mill your beans into a very fine powder, the ideal particle size for a Turkish pot brewing method. Previous: How to store coffee beans? Next: What is the Best Coffee Bean Grinder? Looking for a drip coffee maker? Grinding coffee beans is just step 1 of the whole process. Using a drip coffee maker is a very popular way of getting your perfect grind into your cup of coffee. Let’s Drip Some Coffee has made an excellent list for the best drip coffee makers, including a detailed review of each product. This blog compares and reviews coffee grinders. While my opinions of a product are based on thorough research along with personal experiences, I do receive a commission each time a product is purchased through one of our links. The amount of the commission does not influence the actual rating of a product. Copyright 2017 by Let's Grind Some Coffee.